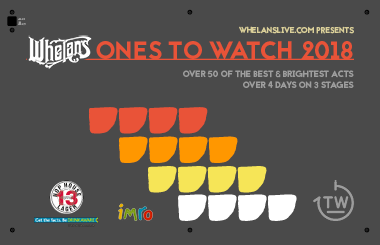 Whelan’s Ones to Watch festival is back! Now in it’s 8th year, we’re continuing our quest to find the best emerging talent in the country, whilst also showcasing artists that have taken the next step and are planning releases in 2018. The festival covers a wide range of music, from Folk, Indie, HipHop, Electronic, Experimental, Rock and more in between. *DUE TO CAPACITY RESTRICTIONS IN THE UPSTAIRS VENUE WE WILL STOP SELLING TICKETS ON THE DOOR AT MIDNIGHT. IF YOU WANT TO SEE ANY ACTS PLAYING AFTER MIDNIGHT PLEASE COLLECT YOUR WRISTBAND BEFORE 11:30PM AND GET TO THE STAGE EARLY.